Over the last year we have seen a number of new fintech companies launch new and interesting products. Everything from Betterment, to Acorns, to Robinhood, there are plenty of new fintech companies working to help consumers. I always keep my eyes out for new and exciting fintech products. With all the recent attention on student loan debt, I decided to start looking around for fintech startups looking to help consumers better manage their student loans. Student loans have become such a huge problem for college graduates. Today, 7 out of 10 college graduates are graduating with some form of student loan debt. What amazes me is that the average graduate is now graduating with over $30,000 in federal and private student loan debt. I would like to review an interesting new fintech startup called LendEDU. You may have seen them in the media recently. 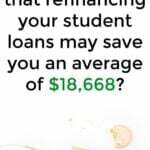 If not, LendEDU is a marketplace for student loans and student loan refinance. In a nutshell, the company lets student loan borrowers get multiple quotes with one application. Sort of like Kayak, LendEDU lets users sort and filter their results to help them find the best options available. LendEDU was founded by Nate Matherson and Matt Lenhard last year. These two founded the company because they found consumers weren’t comparing lenders when it came to student loans. And as a result, consumers were overpaying for their student loans by paying higher than needed interest rates. Consumers shop around when it comes to auto and mortgage loans, why not shop around for student loans too? 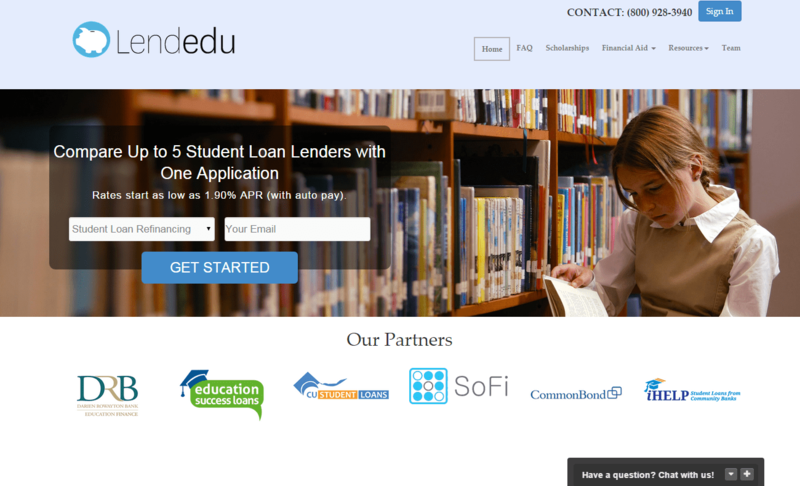 When the company launched last year, LendEDU only worked for student loan refinance. But today, the company can handle newly originated private student loans as well. As tuition bills start hitting mailboxes across the country, LendEDU is a great place to start when looking for private student loans. First, a user must submit a single form at lendedu.com. The form is pretty simple, clear, and easy to use. It took me about 5 minutes to fill out the application. You can track your status using the progress bar at the top of the application. At the very end of the application you will be asked to provide your SSN. You will also agree to a “Credit Bureau Disclosure”. LendEDU collects your SSN to run a “soft credit check”. Soft credit checks do not hurt your credit score. LendEDU uses your credit profile information along with your application information to match you with their lender partners. LendEDU works will all the best in the industry such as SoFi, LendKey (cuStudentLoans), DRB, iHelp, CommonBond, Education Success Loans, Upstart, and U-fi. Each lender has different product offerings, benefits, and rates. The best part about LendEDU is you can get quotes from multiple lenders without ever feeling the affects of a hard credit pull. Most student loan borrowers are quick to just take out a student loan from a big back such as Sallie Mae or Wells Fargo. That being said, there are plenty of other student lenders on the market including credit unions and community banks. Not all lenders are created equal, and not all lenders offer the same rates. By getting quotes from multiple lenders, and different types of lenders, you can be sure that you are getting the lowest possible rate. LendEDU provides up to 9 quotes from traditional banks, online lenders, community banks, and even credit unions. With LendEDU you can get the lowest rate with only one lender application and zero hard credit pulls. Magic! Plus, LendEDU is completely free! What I also love about LendEDU is that the company works to prepare student loan borrowers for their debt. The company offers a number of awesome video courses and guides for free! Some of their great guides include Guide to College Budget, Getting Student Loans Without a Cosigner Guide, and the Student Loan Video Course. LendEDU even has a scholarship search available for free. When you combine consumer education with the best student loan rates, you have a great product. 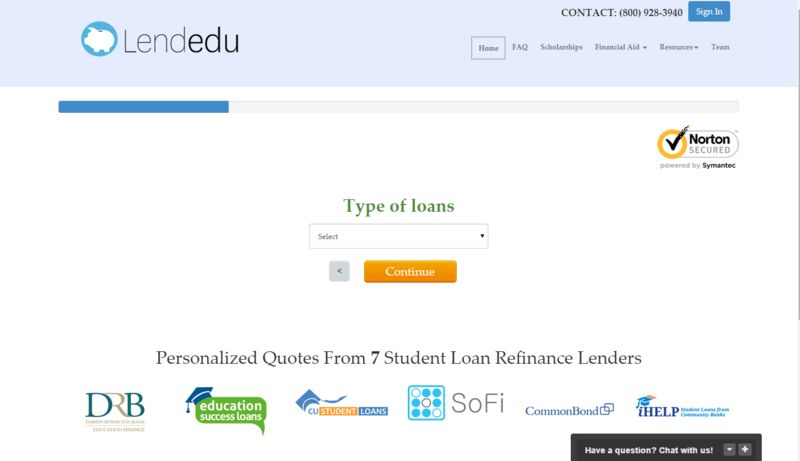 LendEDU is an awesome tool for student loan borrowers. 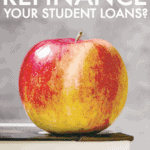 Whether you are looking for a new private student loan or a refinanced loan, LendEDU has got you covered. I give LendEDU my stamp of approval!